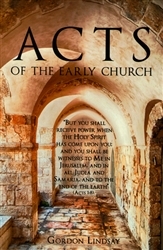 The Book of Acts offers an invaluable link in the New Testament between the gospels and the epistles. Luke, the author, according to Church tradition, recorded the continuing ministry of Jesus through His servants. Jesus had left the Earth with the command to His followers to minister His Good News in all the world. They immediately began to follow in Jesus’ footsteps with signs and wonders following. Gordon Lindsay’s narrative is clear and scripturally literal. He unwaveringly holds to the relational dynamic, which Luke identifies in Acts – True apostolic ministry is always marked with fervor and the signs of Pentecost. Once believers were empowered with the same Spirit Jesus was, they began to do the same extraordinary things He did. As the Christians grew in number, they became a powerful force which angered the Jewish authorities, and those who preached Christ were punished and persecuted. Gamaliel, a leader of the Pharisees, advised the Sanhedrin to leave them along. “. . . for this plan or this work is of men, it will come to nothing; but if it is of God, you cannot overthrow it – lest you even be found to fight against God” (Acts 5:38, 39). The Christian movement had internal struggles, as well as external pressures. However, whenever it moved in the power of the Spirit and in the Word of eternal life, it proved to be a united force that even hell’s gates could not withstand. Born in 1906 in Zion, Illinois, Gordon Lindsay was greatly influenced by the powerful healing and miracles he witnessed. After his conversion to Christ, he quickly began to study the Word and start his ministry. In 1937, he married his wife, Freda. In 1948, he started a monthly publication called The Voice of Healing, which was sent around the world to inform believers of the miracles that were happening during the tent meetings of the great revivalists in the 1950s and 1960s. In 1970, Gordon and Freda co-founded Christ for the Nations Institute, a Bible school that is designed to teach the uncompromising Word of God and how to be led by the Spirit. He has authored over 250 books/booklets that have been distributed to disciple believers all over the world.